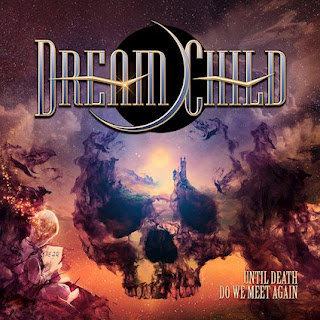 Dream Child is a band comprising of some 80s heavyweights in Craig Goldy (ex-Dio, Guiffria), Simon Wright (ex AC/DC, Dio, Operation:Mindcrime) and Rudy Sarzo ex-Quiet Riot, Ozzy, Whitesnake and Dio). Along for the ride are Wayne Findlay (ex-MSG) and Diego Valdez (Helker). As you can see these guys all have form. 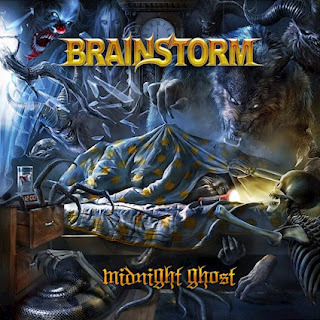 Craig Goldy says, "the band Dream Child was conceived during a brainstorming session with Serafino (President of Frontiers) and I one day while discussing other matters. I had been listening to my favorite bands a lot recently, Deep Purple and Rainbow's “Rising" album, among others in that style and had noticed that many people who also love those bands often have the very same comments as one another: "They don't make music like that anymore!" Even though I said that in passing, Serafino asked me a question that would forever shape my future. He simply asked, "Well, can you?" and I said.....”YES!!!" The video for opener ‘Under The Wire’ has been available for some weeks now, and it just hammers home the Dio legacy that they are aiming for. Spookily the opening tinkles are very close indeed to a part of Tubular Bells, or many may know it as the theme to The Exorcist. ‘You Cant Take Me Down’s’ opening draws on Dio’s Sabbath era and is very ‘Sign Of The Southern Cross’ before Valdez wails and channels his inner Ronnie. If you try to write an 80s classic sounding album in 2018 then the Dio references will come thick and fast due to him having three of the best albums of this period. I can even see Valdez in my minds eye spinning his mic stand as he bangs it out. The guy is a very decent Dio foil indeed. Goldy goes straight for the Strat and the solo is typical Rainbow! So far, so good by me. ‘Games Of Shadows’ does what it says on the tin, another Sabb-Di-bow construction. My ears prick up at the 2:15 point in ‘It Is What It Is’, and I’ll tell you what it is, it’s the exact same riff from Rough Cutt’s ‘Take Her’. Its not even ‘tweaked’ to sound similar. In fact, bands have been sued for less. ‘Playing With Fire’ is the first deviation where the vocals are at a higher register, and with its decent riff and drumming make it different from the norm. The title track ‘Until Death Do We Meet Again’ is Dio by any other name, its like a mix of the ‘big number’ that Ronnie had on all of his albums – Last In Line, Sunset Superman, All The Fools Sailed Away, and is the meat in this sandwich and is huge in sound, scale and length. The next three songs leave me a bit perplexed – ‘Washed Upon The Shore’ has a lengthy into but doesn’t lag for it, but when the vocals do kick in, it’s the one song where they don’t match the high standard of the riff. It’s a song that doesn’t quite know if it wants to be an epic length instrumental (which it should have been) or a song. I could have done without it. ‘In A World So Cold’ is standard fare for them now, but is nothing special. ‘Weird World’ is a bit of a, well, ‘weird’ song compared to the rest of what’s on offer here. Then finally we are onto another lengthy 9 minuter, in ‘One Step Beyond The Grave’ where they redeem themselves from the last few songs. Its got Sarzo’s pounding bass, atmospheric keyboards, and a punchy riff similar to ‘Egypt (The Chains Are On)’. It climaxes with Craig Goldy wringing every last note out of his guitar to the fade out. As an album there’s nothing new here for you, but as a sound harking back to the great days of the 80s, it nails it smack in the middle, and I think that’s what Goldy wanted to do. It transported me to the early 80s. Ronnie would be proud at Goldy’s sentiments, as aside from them doing a tribute album covering his songs, an album produced in a ‘classic rock sound’ doesn’t get much better than this. I could have done with 2-3 fewer tracks towards the end as I feel as if they wanted to fill every second available to them on a CD. Fair dues to all the guys here as lets face it, they could have phoned in their bits from the old rockers care home in Hollywood. Thankfully they have all stepped up to the plate and made it one hell of an enjoyable album, and isnt that what music is all about? Special honourable mention to Rudy Sarzo, Diego Valdez and Wayne Findlay who engineered the studio recordings of their own amazing performances captured on this album!